Transparent material, allows the skin to be seen through the material facilitating visual inspection by the parents or caregiver. The visual inspection helps prevent skin breakdown, irritation and possible sores. 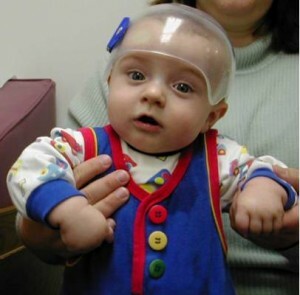 The material is more flexible than the traditional plastics used, which aids in suspension of the device upon the infant’s head, is less bulky, and also allows for growth modifications as the infant’s head develops. The P.A.P. Orthosis can either be active or passive in design. The P.A.P. weighs approximately 5-6 oz, and is available to treat plagiocephalic, brachycephalic and scaphocephalic shaped heads. Positional plagiocephaly is the development of an abnormal shaped head. Fit-Well has had tremendous success with the methods of fitting, manufacturing and patient follow-up, all coming together to produce a fast, safe, and enjoyable treatment program. Fit-Well is currently seeking patent protection for the methods used to create the P.A.P. Orthosis.